The centuries-old technique of lacquering (lacquer fragments have been unearthed from archeological sites in China dating to 5,000 BC) was, and still is, used to decorate furniture, teawares, dinner services, and architectural elements by coating them with multiple layers of plant-derived resin. Layer upon layer was applied, and each was allowed to harden before the next layer was added—a process that could take months or even years. But in the late 18th and 19th centuries, with the pressure to meet the demand of Western traders in China who had only a month or so between sailing dates, Chinese lacquer workers resorted to modified techniques and materials that differed from those used to produce lacquerwares for the domestic Chinese market. These modified techniques included fewer lacquer layers—each only partially cured—as well as minimal preparation of the core and ground layers. The result was poorer quality and durability of the goods made for export. Today conservators are trying to understand the best way to treat these deteriorated objects. 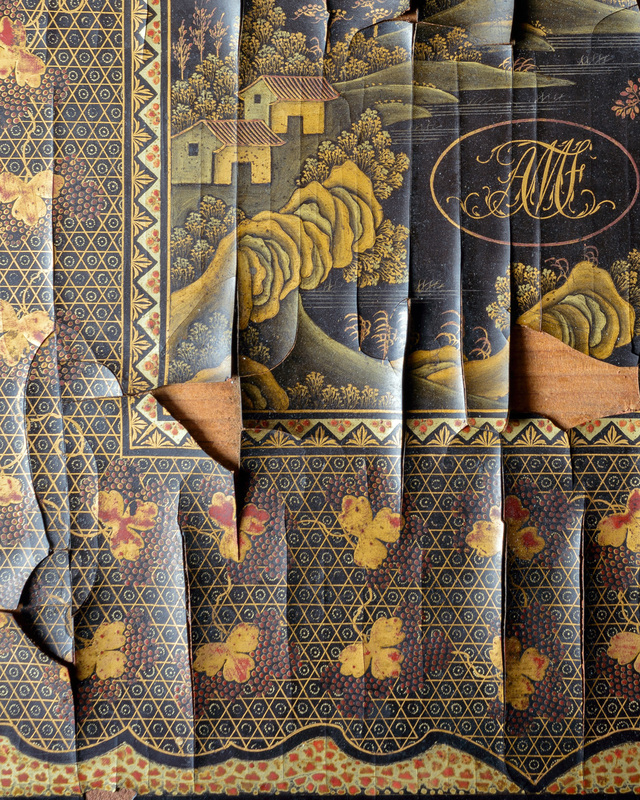 Two objects on view at Winterthur highlight these types of deterioration. One is a tilt-top Chinese export lacquered table that was made between 1830 and 1850, which is on display in the Brittle Beauty: Understanding and Conserving Chinese Export Lacquer exhibit. 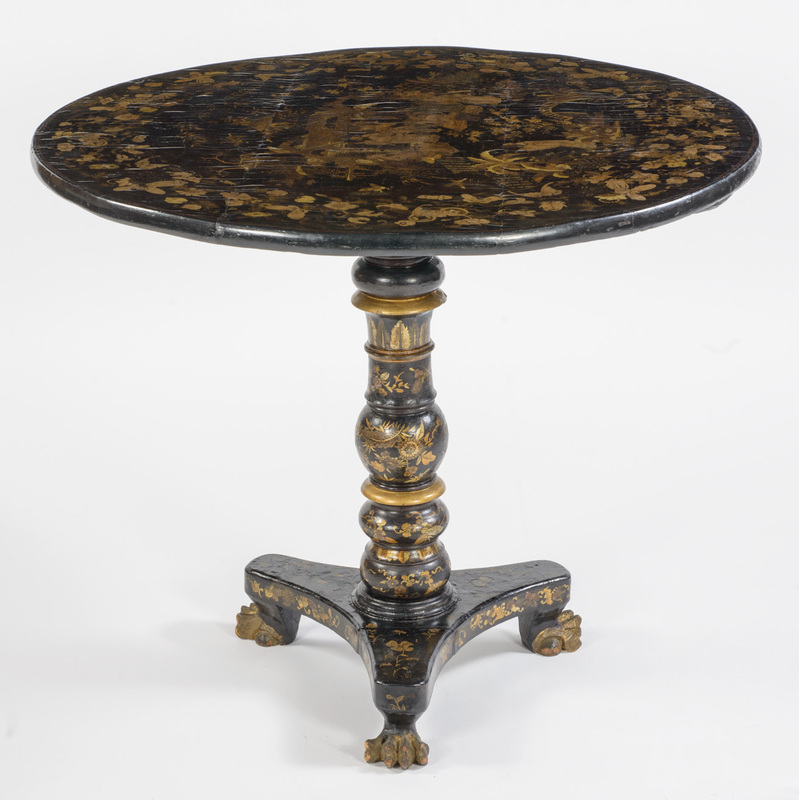 The intricately decorated tabletop was split, and the lacquer surface of the table had become dull with age. Its treatment at Winterthur included consolidation, cleaning, and loss compensation. The split in the wooden core of the tabletop was closed and adhered with animal glue. Conservators used a clamping system in order to reattach the lifting lacquer to the substrate. Shellac layers used to restore the shine of the lacquer had been added to this table but have since darkened and yellowed, obscuring the design and colors. After evaluating this surface, conservators decided not to remove the shellac layer because it has served to protect the lacquer and gold decoration from additional deterioration. Instead, they cleaned and preserved the shellac layer. Left: detail of the table decoration coated in a later layer of shellac, before cleaning. Right: same detail with the cleaned and preserved shellac layer. 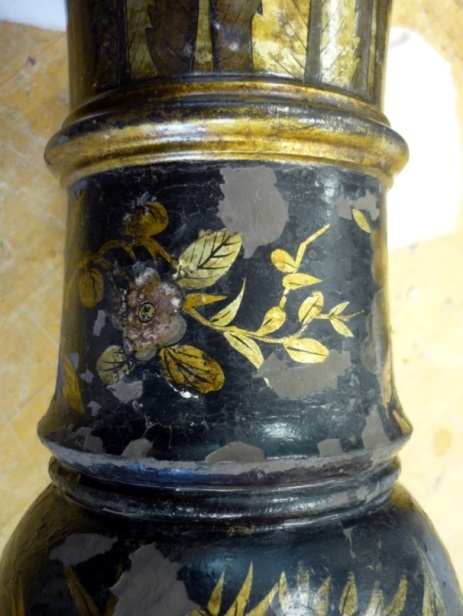 In areas where lacquer was missing, conservators compensated for these losses by filling in with dark-color, polyvinyl, alcohol-based putty, which was then leveled and painted to match the color of the surrounding lacquer. for study and teaching purposes. It is an example of how the modified process and the use of different materials impact the lacquered object. When the time-consuming methods of traditional lacquer were abandoned, cores were made from improperly seasoned wood prone to splitting along the grain. The traditional lacquer process requires applying liquid lacquer in thin coats in numerous layers. Care is taken to harden each layer before it is smoothed and prepared for the next coat by rubbing the hardened surface with a pumice stone or soft clay brick. Final coats are applied with fine brushes to be sure that there are no brush marks. However, on the sewing box, you can see grainy preparatory brown ground on the underside of the partially delaminated, lifted sections of lacquer (area 1, below). This damage was probably caused by the replacement of lacquer with animal glue within the preparatory layer. This substitution promotes loss of adhesion between the substrate, or base, and the lacquer layers. Rather than many thin coats of lacquer, evidence shows only a few, thickly applied lacquer layers on this box. These layers did not dry properly, and as they continued to cure over time, they cracked and lifted (area 2, above). While the decoration on the sewing box was executed according to traditional lacquer techniques—by applying gold and silver powders to an underlayer of red lacquer—the final step of sealing the decoration with a transparent protective finish was skipped. The result is that the dark red lacquer is exposed in areas where the gold has worn away (area 3, above). 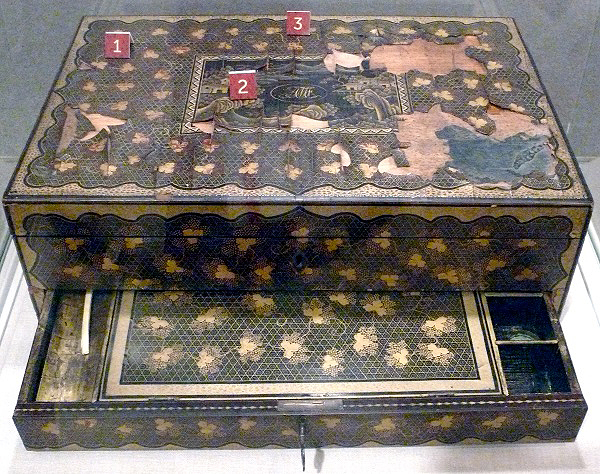 Fortunately, untreated objects like this sewing box provide useful information to conservators. The tilt-top table and five other lacquered objects from the Winterthur collection have recently been studied and treated as part of an Institute of Museum and Library Services (IMLS) grant that is funding treatment and scientific analysis of these pieces in order to better understand Chinese lacquer made specifically for the Western trade. 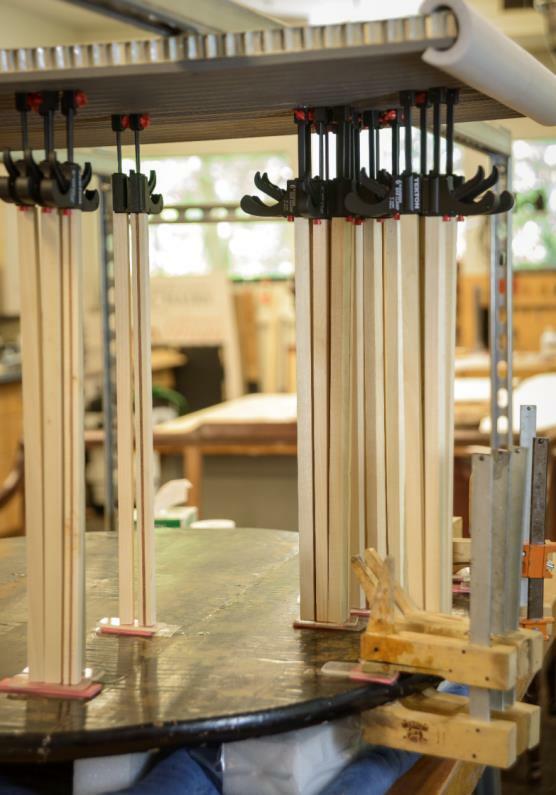 With the help of this grant, Winterthur conservators are working to develop best practices for treating these objects and to train conservators elsewhere. For those with interest in Chinese export lacquer, visit Brittle Beauty: Understanding and Conserving Chinese Export Lacquer. For those interested in conservation of Chinese export lacquer, attend our Chinese Export Lacquer Symposium and Workshop on October 29‒30, 2015. This entry was posted in Academic Programs, American Culture Studies, Art Conservation, Decorative Arts, Furniture, Students & Alumni, Uncategorized and tagged antiques, chinese lacquer, conservation, furniture, H. F. du Pont, lacquer, museum, sewing, Winterthur, Winterthur Museum, Winterthur Museum Garden & Library. Bookmark the permalink.